In the years following the Second World War, Wales underwent a remarkable explosion in its musical development and for the first time there emerged a group of Welsh composers of international significance. Amongst the most prominent of these was Alun Hoddinott. Born in Bargoed, Hoddinott initially saw himself as a violinist (he was a founder member of the National Youth Orchestra of Wales in 1946) but was already composing prolifically by the time he entered the Music Department of Cardiff University. 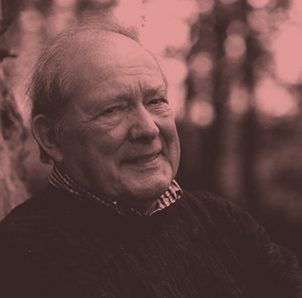 His first major exposure came with a performance of his First Clarinet Concerto at the 1954 Cheltenham Festival and in the decade that followed he quickly established himself as one of the leading Welsh composers of his generation. In 1967 Hoddinott became Professor and Head of the Music Department of University College Cardiff and was responsible for launching the Festival of 20th Century Music. Yet, far from impeding his progress as a composer, his output if anything increased. Night after night, into the small hours, he composed steadily amassing an impressive portfolio of symphonies, concertos, sonatas and works in virtually all genres. In 1974 his first opera, The Beach of Falesá was premiered by Welsh National Opera and he went on to write a further five operas. The last of these, Tower, was premiered in 1999 and was based on the events of 1994 when the workforce of Tower Colliery in the South Wales valleys saved their workplace from closure. Hoddinott was one of the most prolific composers of his generation with several hundred works to his name. He spent the last years of his life in the Gower continuing to be one of Wales’s busiest composers. His final orchestral work, Taliesin, was heard at the 2009 Swansea Festival. Alun Hoddinott's manuscripts are held at the National Library of Wales. Please visit the database of their collection here. Mae llawysgrifau Alun Hoddinott o fewn casgliad Llyfrgell Genedlaethol Cymru. Ewch i chwilio'u bas data yma. Hoddinott first made a mark as a composer with his Clarinet Concerto (1950) which the BBC broadcast from Cardiff in 1951. The first public performance at the 1954 Cheltenham Festival then put the composer on the international map and he went on to compose an Oboe Concerto in 1955 and a Harp Concerto for Osian Ellis in 1957. In 1960 came the first two of Hoddinott’s three piano concertos. His relish of the concerto form is evident in the mercurial brilliance with which he varies these two works, whose composition was only separated by the Sextet Op.20, and the first of which is accompanied by wind, brass and percussion only. 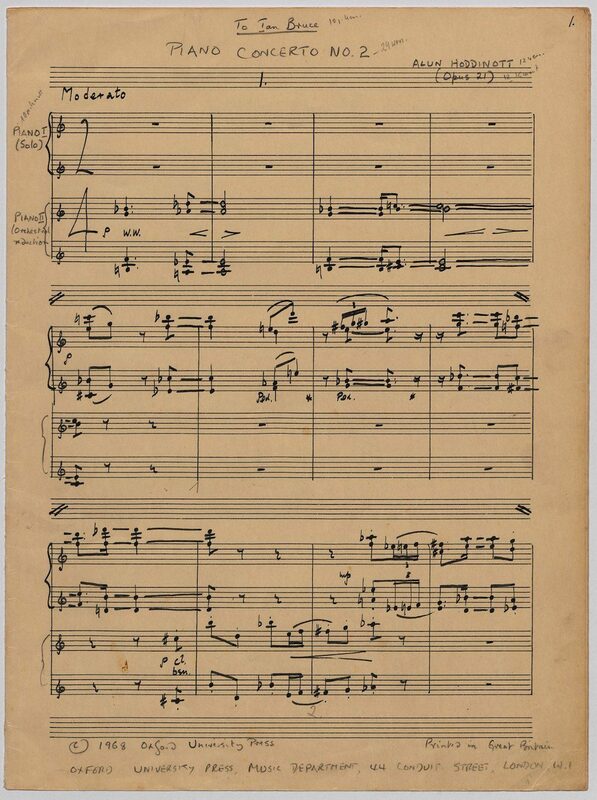 Both were composed for pianist Valerie Tryon, a contemporary specialist, and No.2 was premiered at the National Eisteddfod held in Cardiff, with the composer conducting the London Symphony Orchestra. In three contrasted movements: Moderato – Adagio – Allegro, the work lasts 20 minutes and is available on a Lyrita recording played by Martin Jones with the RPO conducted by Sir Andrew Davis. 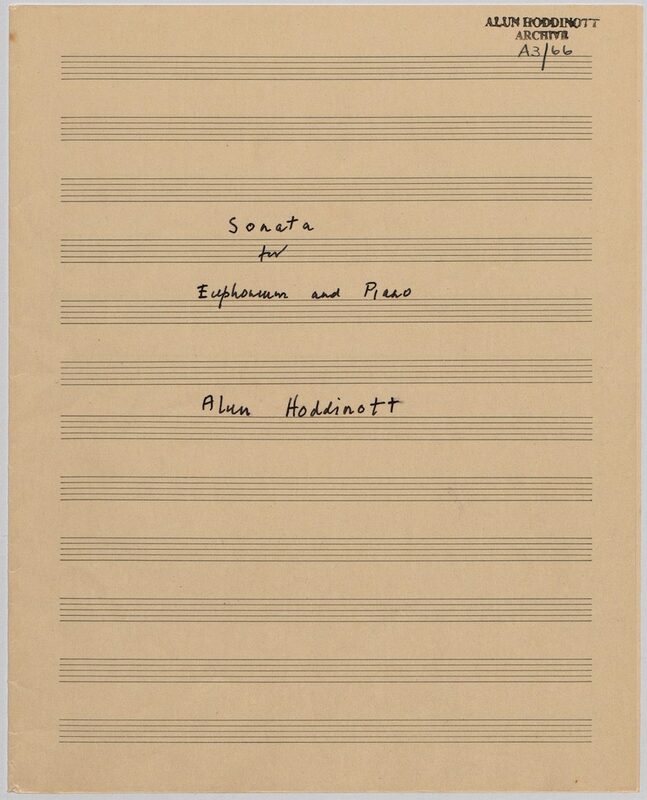 The screen shows the first 5 pages of the composer’s neat score of his arrangement for two pianos designed specifically for publication by Oxford University Press in 1968. 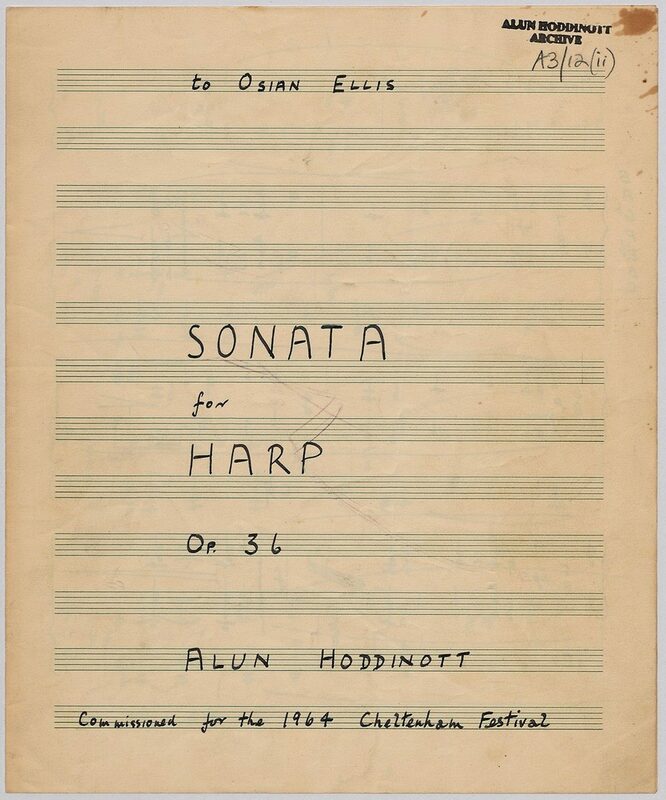 The first of Hoddinott’s three cello sonatas was composed in 1970. In 1967 he became Professor and Head of the Music Department at Cardiff University (his alma mater) where the faculty staff included a resident piano quintet. Hoddinott did much to promote the Ensemble’s wider profile in terms of recordings, broadcasts, festival concerts and performances outside Wales. This Sonata is a fine example – composed for cellist George Isaac and pianist Eric Harrison to play at London’s Wigmore Hall on May 15th, 1970, with an Argo (Decca) recording to follow (not currently available or transferred to cd). In two connected movements lasting some 15 minutes, a brooding Andante leads via an unaccompanied cadenza into a lively Allegro molto which transforms much of the material already heard. 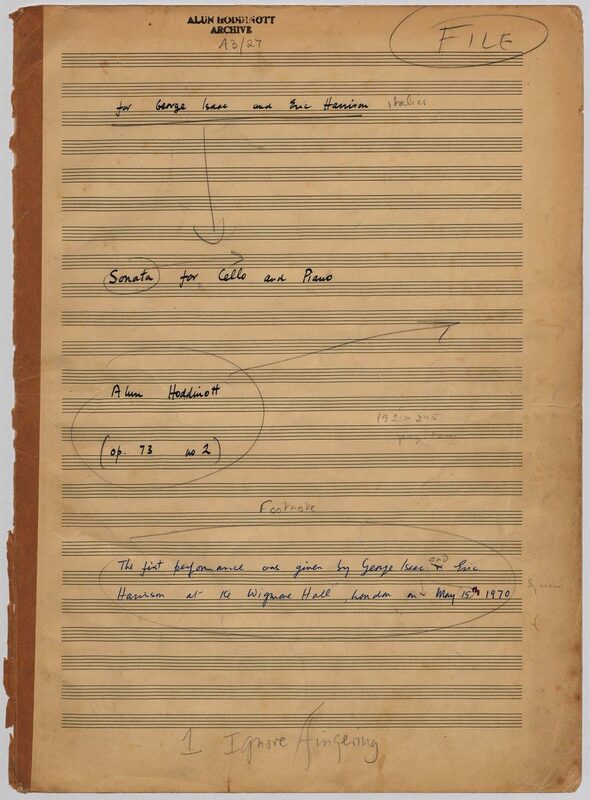 The screen shows the composer’s final manuscript score, which was published by OUP in 1970.The two subsequent sonatas were composed in 1977 (op.96 No.1) and 1996 (op.159) respectively. Hoddinott was always keen to respond to gifted young instrumentalists and singers and one of the performers with whom he developed a close bond in his later years was the exceptional young euphonium player David Childs. In 2002 he wrote a Concerto for him entitled ‘The Sunne Rising’, op.180, which was a punning reference (via John Donne) to the fact that Childs was the son of another very distinguished brass player and conductor, Robert Childs. David went on to play the Concerto at the 2004 Proms in London and later recorded it for Chandos. Far from exhausting his interest in this noble instrument Hoddinott went on almost immediately to follow the Concerto with a Sonata, which Childs, together with pianist John Wilson premiered at the Wigmore Hall on April 7th 2003. Its two movements – Andante and Allegro – last around ten minutes and deliberately emphasise the lyrical eloquence and rhythmic agility of an instrument not often associated with either characteristic. The screen shows the final manuscript which was then published by Oriana Publications in 2003.